Last week Broadsheet called the recession a feminist issue. This is especially true in Japan, where financially savvy housewives may have helped inflate the worldwide economic bubble. According to David Pilling in the Financial Times, Japanese housewives — sometimes collectively called "Mrs. Watanabe" — have controlled most of the country's savings since WWII. With interest at Japanese banks close to zero in the early 2000s, Mrs. Watanabe began investing in foreign currency, and in more exotic financial instruments like foreign-invested mutual funds, collateralized debt obligations, and even eastern European mortgages. The outflow of money caused the yen to fall, and contributed to the worldwide excess liquidity that may have helped cause the financial crisis. Take a typical Hollywood film when something goes bump in the night. [...] The wife would invariably say to the husband: 'Do something. Go and see what this is all about.' But in a Japanese setting, it would be the woman who gets up and takes care of things. [...] The men pretend to control the larger decisions. There's a lot of keeping up appearances in terms of letting the men feel that that's the case. But all the groundwork has been done by the wife. It's just an endorsement ritual that the men get up to. But since they began investing abroad, women have gained new fame. Yukiko Ibebe neglected to pay taxes on the 400 million yen she made in currency trading, but she parlayed her success into a lecture tour and book. And Fumie Wakabayashi has her own investment game for Nintendo DS. Still, Mrs. Watanabe may not be getting as much respect as a Mr. Watanabe might. 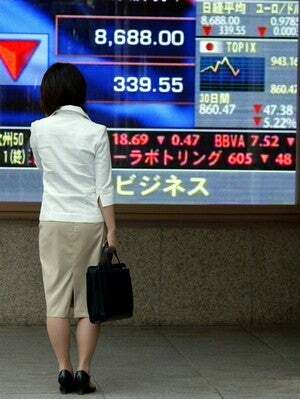 Of investor Nakako Ishiyama, Pilling writes: "As she lists each one she invariably adds as a suffix the words nantoka nantoka – 'something or other' or 'thingamajig.' It is not altogether reassuring." Ishiyama's investments did lose money, but so have most people's, and there is evidence that some financial instruments on the market before the crisis were too complicated for even investment bankers to understand. Pilling's piece is otherwise pretty balanced, but its portrayal of Ishiyama as a "shy and anxious" bubblehead shows that the recession — and coverage thereof — is definitely a feminist issue.